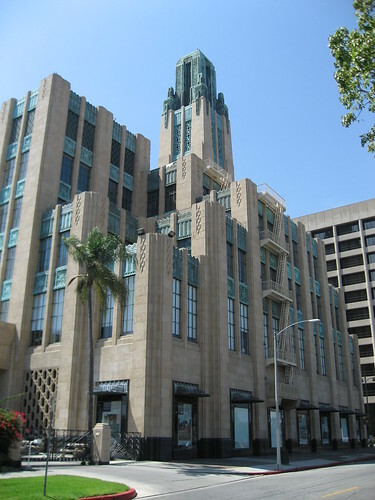 By the time Bullock’s Wilshire opened in September of 1929, John Bullock had been running (if not owning) Bullock’s at Seventh and Broadway in downtown Los Angeles for more than twenty years. After a boatload of expansions to that store and the death of owner Arthur Letts, Bullock made the decision to build an even bigger, more luxurious flagship store – out in the suburbs. 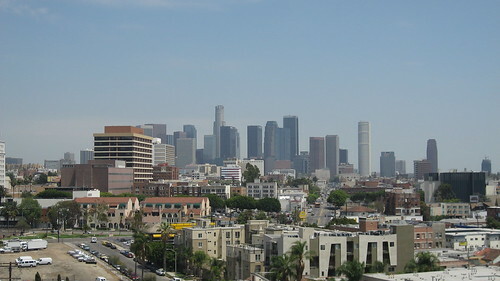 Bullock and the vice president of Bullock's Inc., Percy Winnett, anticipated the westward expansion of the city’s population and chose for their new store a location on the other side of Westlake (now MacArthur) Park. 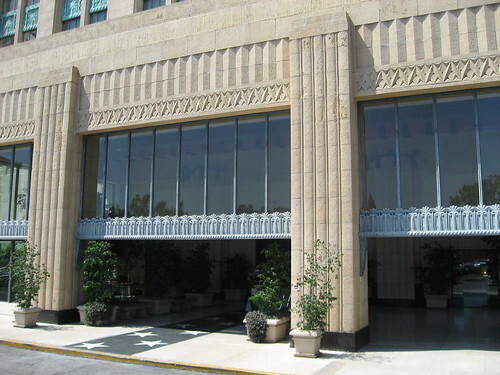 The new, two-million dollar Art Deco department store on the elite Wilshire Boulevard was designed by the father and son architect team of John and Donald Parkinson. 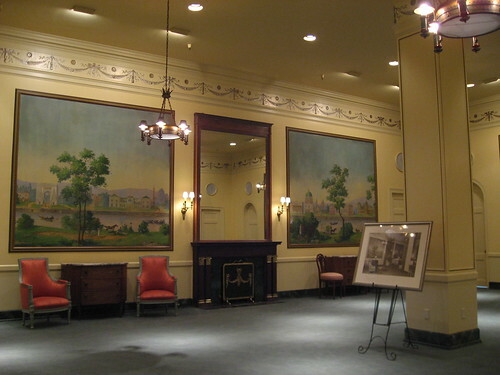 The men had already partly or completely designed the downtown Bullock’s and more than a few L.A. landmarks, including the Los Angeles Athletic Club (No. 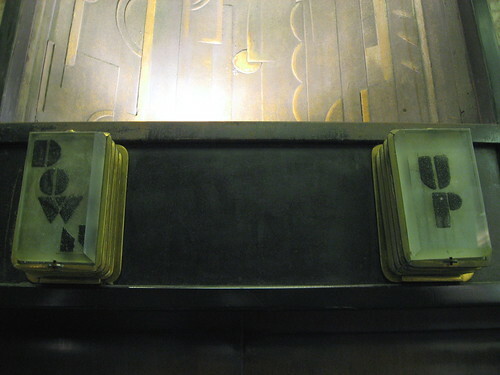 69), City Hall (No. 150), and the Security Trust and Saving Buildings in Hollywood (No. 334) and Highland Park (No. 575). They’d go on to design Union Station (No. 101). The building was originally to reach ten stories, but made it to just five. 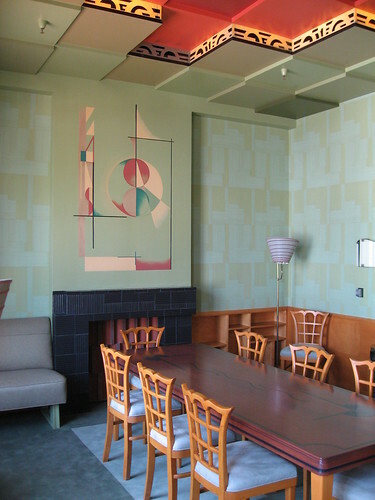 The interior design was handled by Jock Peters. 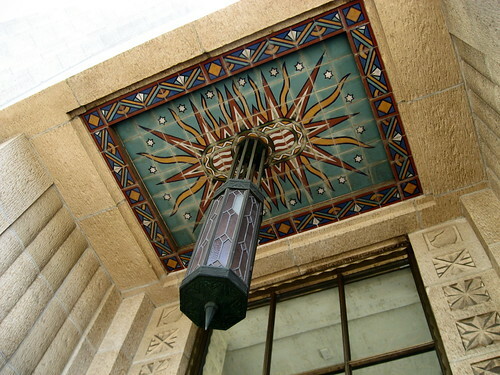 This design on the Wilshire Boulevard side was created by George Stanley, who originally sculpted the Oscar statuette. 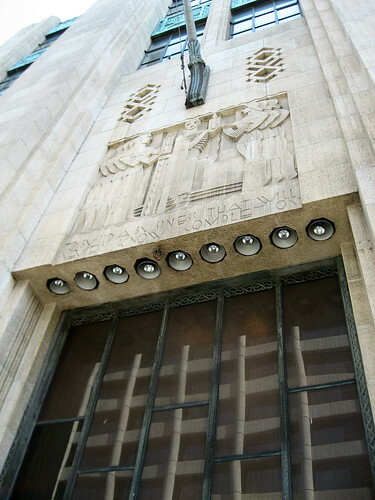 So while the Wilshire side is often considered the front of the store, the true entrance is on the south side. A shot of the motor court/porte cochere through which shoppers in their cars would arrive (from the right). 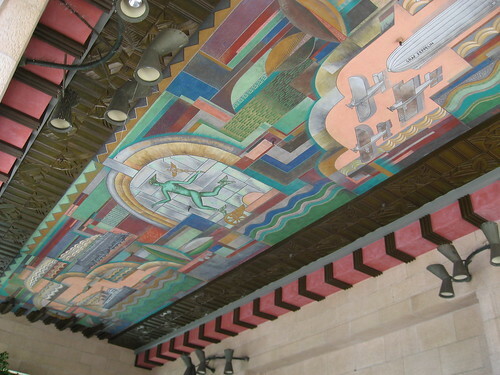 The ceiling of the motor court is this mural by Herman Sachs called Spirit of Transportation. 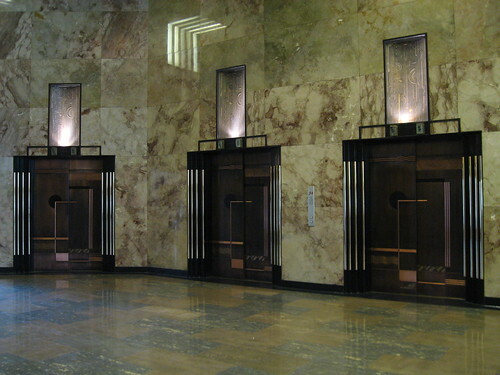 The banks of elevators you see when entering the building. 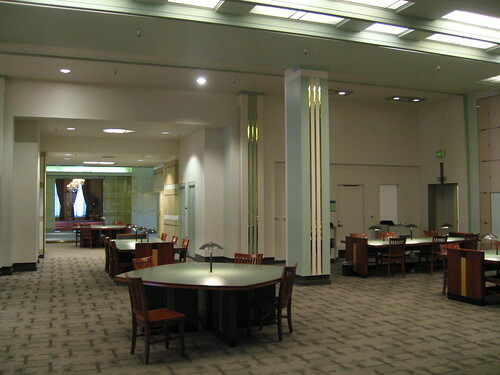 Now the Julian C. Dixon Courtroom and Advocacy Center, this space held the Accessories Department back in the day. 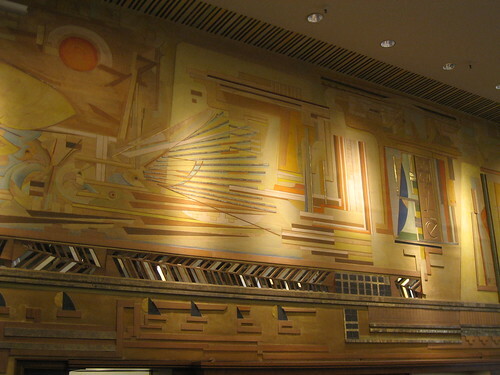 The old Sportswear Department bears this mural, The Spirit of the Sports, by Gjura Stojano. A remnant of the Saddle Shop. 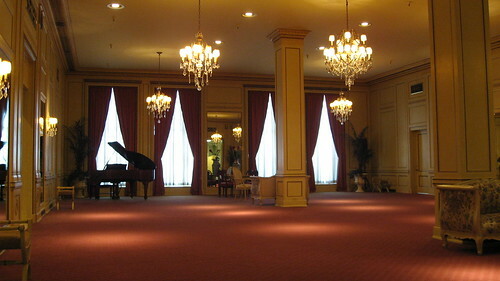 The room below once held the Menswear Department. 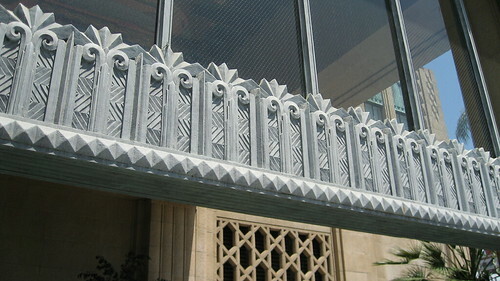 The design was a tribute to Frank Lloyd Wright. 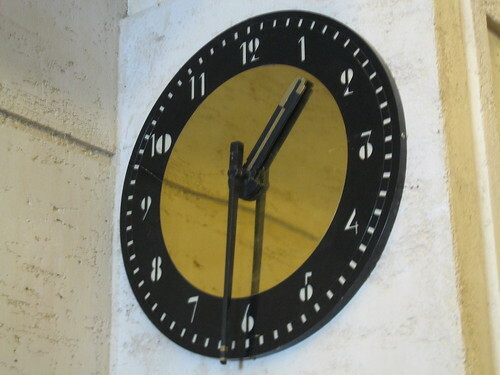 There were thirty clocks designed for Bullock's Wilshire. Here's one of them. Moving onto the second floor, there's Irene's Salon, named for Irene (Gibbons). Models would sashay out and show off dresses created by the MGM costume designer. Here's the Louis XVI Period Room, used for viewing more designer dresses. 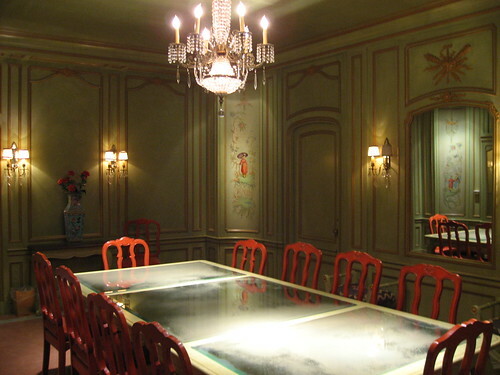 This was the Coco Chanel Room, where Chanel displayed her dresses. It's now the Chanel Conference Room. 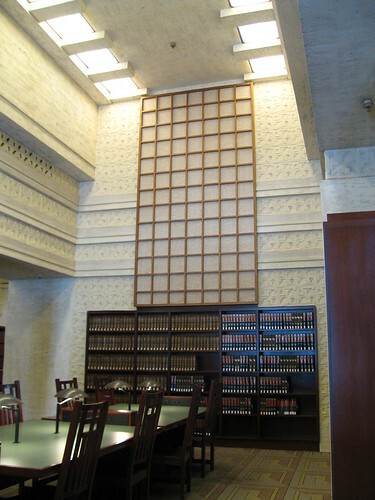 The third and fourth floors (not pictured) were originally dedicated to college and high school girls (floor 3) and children (floor 4). 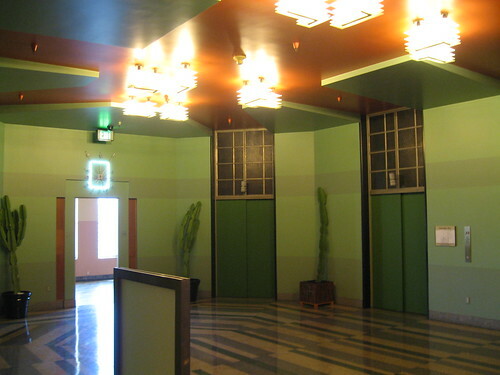 When you step off the fifth floor elevators, you walk into this lobby, evoking the old Cactus Room. 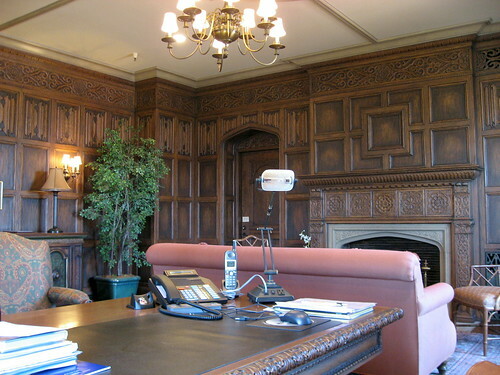 Above is the oak-paneled office of the Dean of Southwestern Law School, formerly the office of John Bullock. 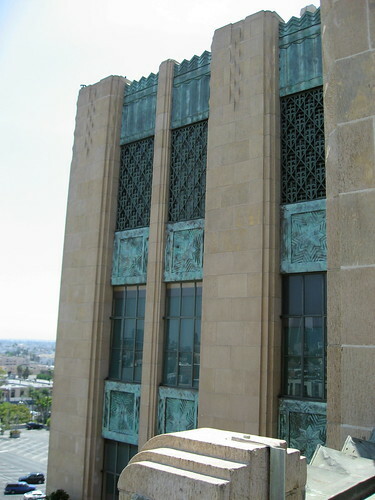 The Dean's Office opens onto a terrace from which you get great views of not only downtown L.A., but also of that 241-foot tower and a close-up of the building's copper. In February of 1944, Bullock's Inc. merged with the I. Magnin & Co. retail chain. Twenty years later, the company sold out to Federated Department Stores Inc. Then, in 1988, Federated got chopped up, with the Bullock's and Magnin parts going to Macy's, who shut down the 64-year-old landmark in 1993. The store's first floor received its fair share of damage in the 1992 riots. 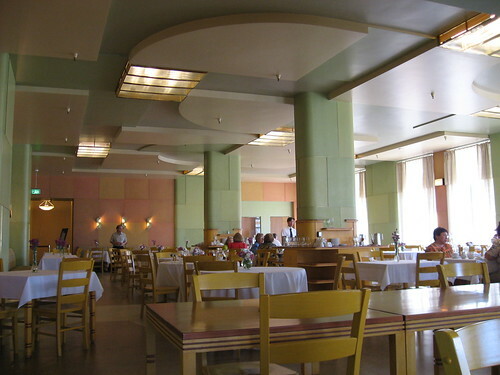 The Salle Moderne, once a dining room. 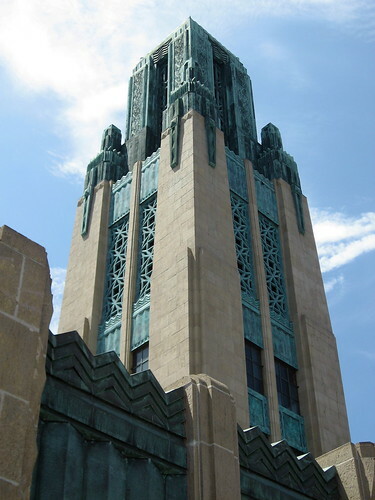 You can see Bullock's Wilshire in Topper, Bugsy, and Family Plot, among other movies. A couple of episodes of Murder, She Wrote were filmed here - the show's star, Angela Lansbury, worked as a sales clerk at the store in the early 1940s. Check out the original flooring. 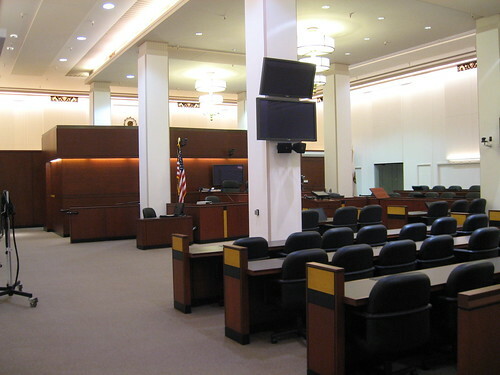 In 1994, Southwestern Law School stepped in and bought not only the building, but also the land it stood on (the plot had been owned by CalTech - go figure). 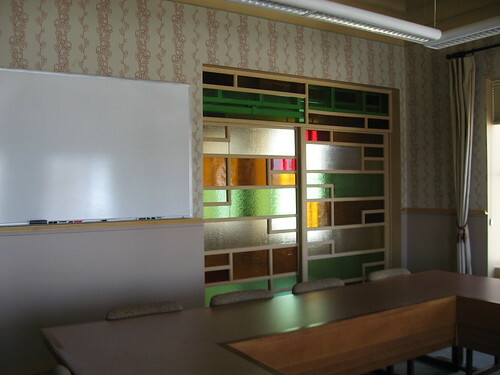 Southwestern began what was figured to be an eventual $20 million restoration process. Ronald Altoon served as restoration architect. 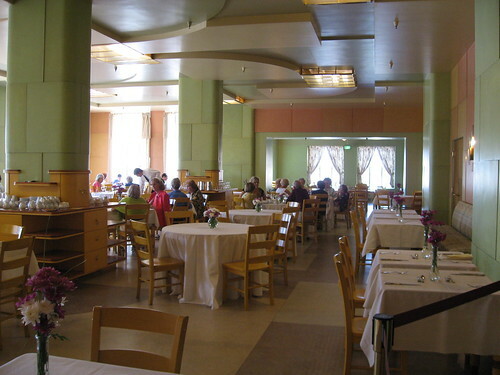 This is the famous Tea Room, where you dined while, again, viewing models in designer dresses. 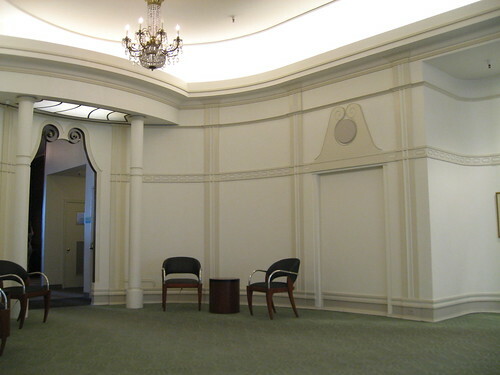 A little conference room on the other side of the Tea Room Alcove. 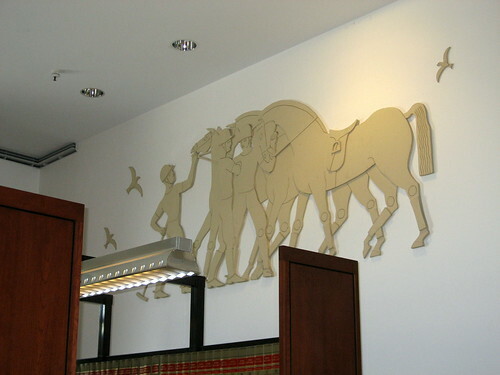 A big hats off to Southwestern Law School. They've been opening up the school once a year for special "Tea and Tours". During this past tour, in July, the school couldn't have been more welcoming, especially to those who wanted to take tons of pictures (and there were many of us). It was a great afternoon. Thanks. Maybe my favorite room in the building: a space used for more private viewing of - sigh - models in designer dresses. Of course, I got a lot of this information from the tour itself, but the real comprehensive source for all things Bullock's Wilshire is the insanely comprehensive Bullocks Wilshire by Margaret Leslie Davis, published in 1996 and now out of print. 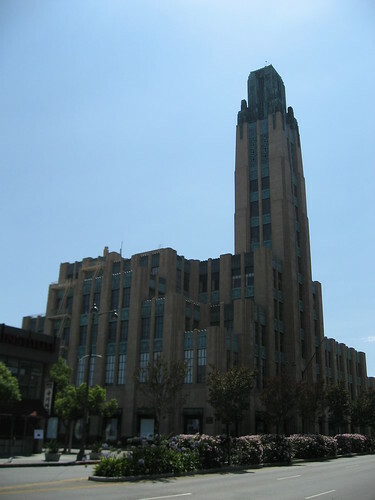 The Bullock's Wilshire Building is also on the list of National Register of Historic Places. I had no idea we had buildings of this beauty here in LA. Truly incredible, especially because I've seen the outside of this building many times! Sigh. Your beautiful photos make me long for the days when this store was still in business. I lived in San Francisco and made frequent trips to Los Angeles, many of which included shopping trip to Bullock's Wilshire. Even though I couldn't really afford to shop there, it was always a treat to visit. I'll never forgive Macy's for destroying such a beautiful institution, and I've never spent a dime in any of their stores since they abandoned BW. Thanks for the comment, Paul. I would've loved to have seen this in operation as a department store. On the bright side, Southwestern Law School has done an admirable job in adapting the building to their use while preserving and even restoring much of what must've made it such an experience to shop there. Percy Winnett. He makes me proud to be a Winnett. Justice to the buildings renovation by a law school! Thanks for checking in, Winnett. I'm a third year law student at Southwestern Law School, and I must say, it's quite an honor to be a part of such a Los Angeles treasure. Walking into the building every morning never gets old. I have a tremendous respect for the building's history and significance. Anonymous, it's a great thing the school, on occasion, allows us non-students to visit. 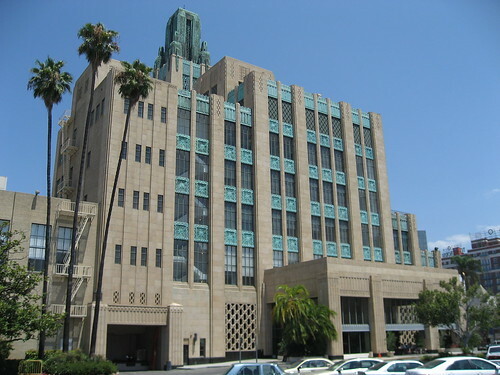 I was a mere 17 year old in 1987 when I was hired by an advertising company and the address was 3055 Wilshire Blvd. My office was on the second floor and my view for almost 8 years was none other than Bullocks Wilshire! When I turned 18, my boss took me to the Tea Room for my birthday lunch. I felt very important and took in all the beauty of the building. It had a charm like no other placed I had experienced in all my 18 years! I couldn’t afford anything in the department store either but I didn’t hesitate when they announced they were closing and everything was marked down. I used to love going in and trying some of the expensive perfumes. It always smelled so good in there. I was very sad when it closed. We were still in the building in 1992 when the riots occurred. 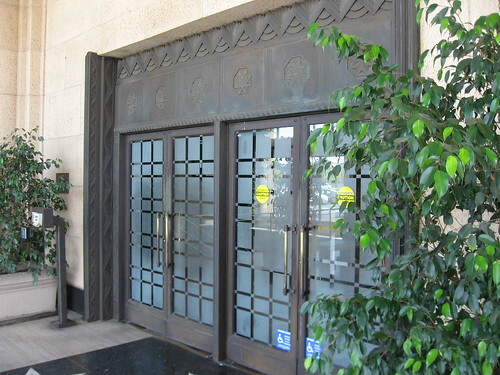 That was a very scary day and subsequently our offices moved to 5770 Wilshire Blvd. (17th floor) across from the La Brea Tar Pitts. It was a nicer area by comparison but after the 9/11 attacks, our office moved again. This time to a smaller two-story building in Pasadena. Yeah, I’m still with the same company. It’s been 22 years! 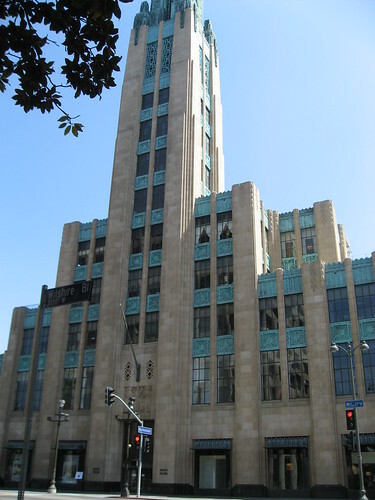 I was a buyer at Bullock's Wilshire from 1976 until 1980. I recently drove by and was allowed to walk into the lobby by the security guard. It brought back so many memories. I looked at a stairway that lead to my office and was overcome with memories of working there along with the thousands of stories told to me by the older buyers about movie stars, and Christmas parties, and the "mink hats" that came in eveyday to the tea room. Someday I should write down all those stories...it must have been a wonderful and magical time. I've just been forwarded your great blog by a friend. I was an Assistant Buyer for Bullock's (BW had it's own team of buyers)at the time of the Federated/Campeau/Macy's debacle. A minor correction and an additional fact: Bullock's acquired I.Magnin & Co. in 1944; they did not merge. 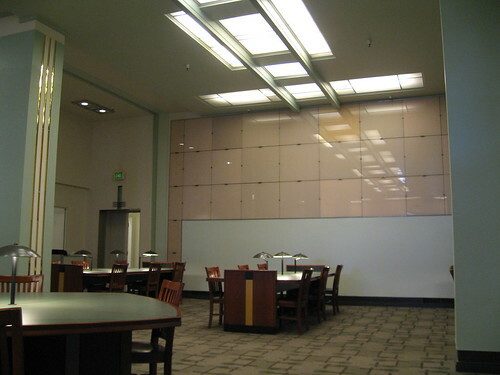 I.Magnin retained its own offices in San Francisco. You are correct that Bullock's Inc 'sold out' to Federated om 1964. In the early 70's,Bullock's separated into a sub-division the Wilshire and Palm Springs locations and subsequent mall stores with their own buyers etc. It was then that the apostrophe was removed and 'Bullocks Wilshire came to be.' In 1988, R.H. Macy would purchase Bullock's/BW and I.Magnin from Campeau for 1 billion dollars. Fond, fond memories of working there. I'd go there even on my days off to soak in the ambience. My happy pill. 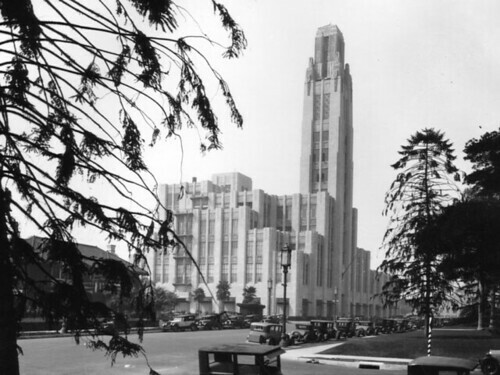 The stories behind Bullocks Wilshire, the rich character and beauty of its history--surely a movie waiting to be told. An epic cram or even a Romantic Comedy. It needs a latter day Cary Grant and a Ernst Lubitsch-type director to pull it off and keep it truly a period piece, undaunted by modern tactics of throw-away gags, gimmicks and juvenile trains of thought. If I were rich, I'd produce it. As it is, I am tempted to circulate a writing contest and the winner's screenplay would be pushed to industry people who could make something like this happen. By the way, read Margaret Davis' book about the place. My mother Frances Loftus was hired to help create the kitchen of the TeaRoom in l929. 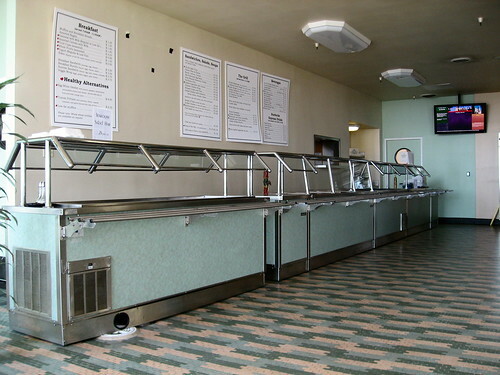 It was one of the first kitchens to use stainless steel for countertops, etc. I have some of the recipes used during that period. 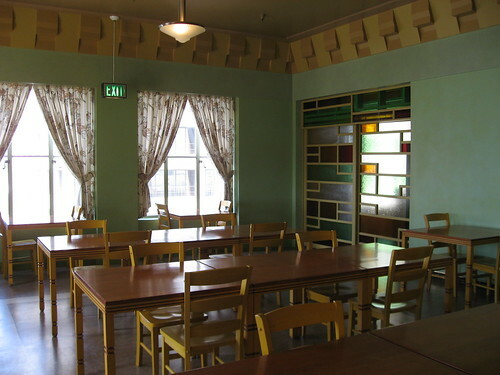 I miss going to the tearoom and I feel sad that I couldnt share the joy with my daughters or grandchildren, for it was closed. I honestly believe there are enough people to have kept the tearoom alive. Did this ever bring back memories. I was 20 years old and working on Virgil Avenue, right down the street from Bullock's Wilshire. I remember many lunch hours shopping at the perfume counter, and then moving on to the accessory room. 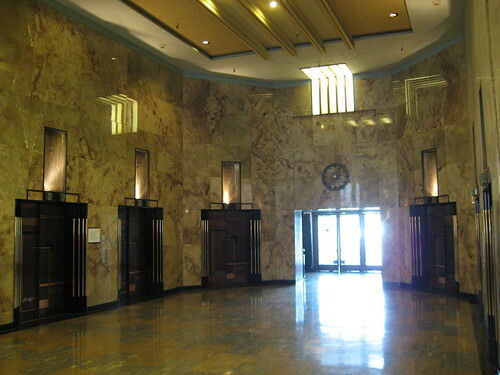 The room with the elevator banks was absolutely gorgeous. Everything was so spectacular - a far cry frm the buildings of today! I'm so glad I got to experience this beautiful architectural establishment when it was fully-operational. I loved this store, I remember when my Grandmother came to visit, we went to the Tearoom for lunch. It was magical. The thing I remember most was the elevator operators, they had to time perfectly pulling the lever so the doors would open at the right spot. I was a busboy in the tea room in the early 1960s when the glamor of old Hollywood was still there. Mr. Winnett dined there every lunch hour, flirting with models. I poured water for Doris Day and others. Irene had her seasonal fashion shows there. 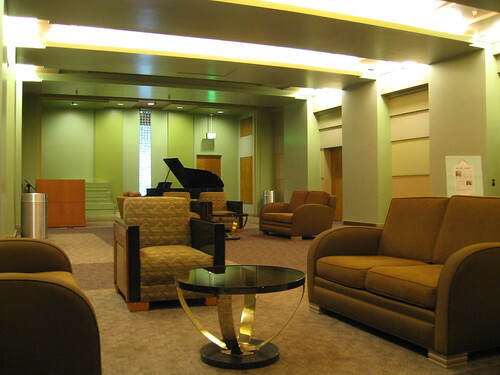 We hung out in the old penthouse, which was a staff lounge and went onto the terrace overlooking Wilshire Blvd. and told jokes. It was grand, because it was a living thing with all the people and history; it looks very dead and stark now. It was intimidating to be among such rarefied people. Nobody ever made a fuss over the celebrities either! Sure, Ryan, and thanks for asking. 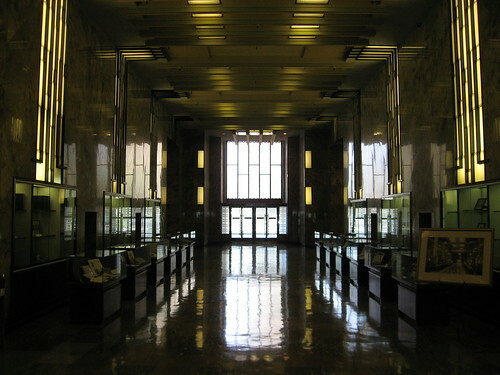 I enjoyed seeing the photos you show of Bullock's Wilshire. I remember vividly how beautiful it was in the 1950's, when I was a young girl, and my grandmother would take me to the Tea Room for the luncheon and fashion show. 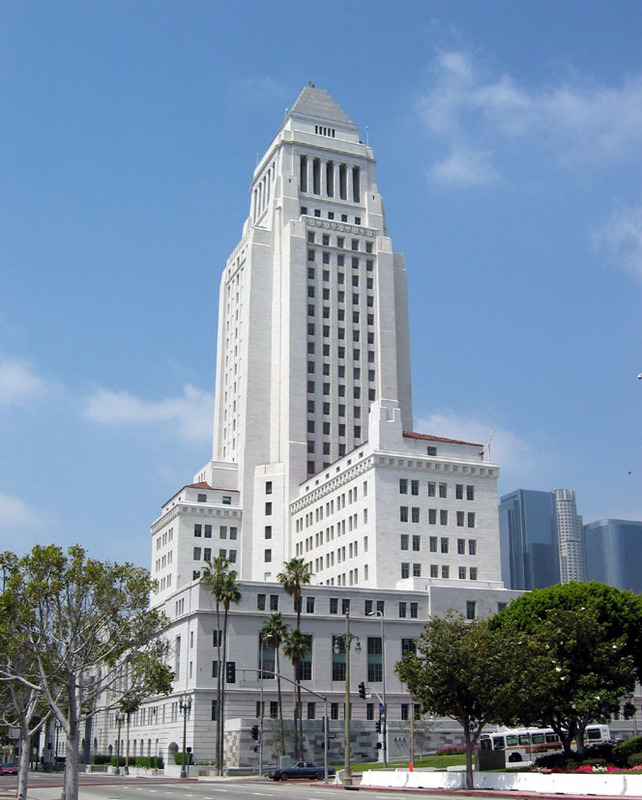 Now, as I am doing my genealogy, I recall that my father told me that when he was a young boy during the 1920's, my grandparents purchased from John Bullock a home which stood there on Wilshire Blvd., and had it moved several blocks away. This became their family home and Mr. Bullock built Bullock's Wilshire where that home had once been. I am now trying to verify this story. I was a former Buyer at the Bullock's Department stores in the late 70's and 80's. 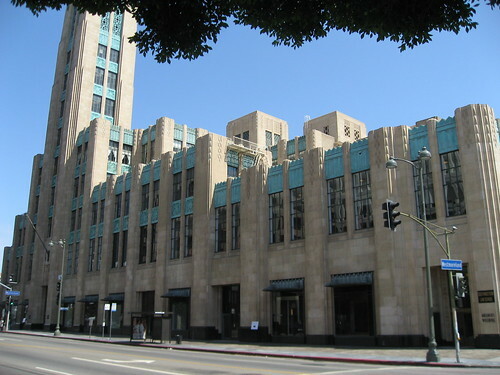 I started a Facebook Group called "Bullock's Department Store Memories" which members of the group can tell their experiences of Bullock's and Bullocks Wilshire. It is a great group and a very passionate one that loves the Bullock's experience either as a associate of Bullock's or as a shopper. As a little black girl in the 70s I remember my mother taking me and my siblings on many many awesome adventures at Bullock's on Lake St. in Pasadena. My mother loved all of the food at the Tea Room, especially the Chicken a la King and the Popovers! She also loved the Heavenly Pie. Every year, my mother would take us to see the Easter Bunny and Santa Claus during the holidays for breakfast and a picture. I will never forget the memories, food, fun and laughter!